R.L. Lehman Jr. began operating here in Pollok, Texas in the 1960's with a small part time operation. We have always grown according to the needs of our customers. From a beginning of erecting steel buildings, manufacturing trailers, and agricultural products, we have evolved into a complete steel service center focusing primarily on supplying products to our customers. 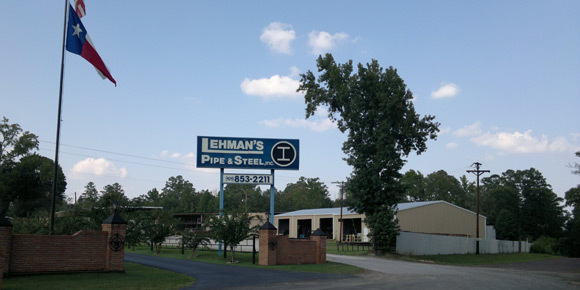 Lehman's stocks a broad range of structural steel, new and used pipe, and trailer parts. With the completion of our 36,000 square foot warehouse, we have expanded our metal building component division into a complete manufacturing facility which enables us to rollform our own roofing. Three profiles, R, AG, and M panel are available. We can also build standard and custom trim up to twenty feet long.